Official synopsis: "Torak has survived the summer and his heart-stopping adventure in the Seal Islands. He and Wolf are together again. But their reunion is all too short-lived. As mid winter approaches Torak learns the worst from the White Fox clan - Wolf has been snatched. In a desperate bid to rescue him Torak and Renn must brave the frozen wilderness of the Far North. They tread a deadly dangerous path as they step into a world of deceit,treachery and lies and come face to face with the the most powerful and feared mages alive. Cruel Thiazzi, the Oak Tree Mage, Seshru the Viper Mage, beautiful and manipulative, and Nef the gruff Bat Mage - here too is Eostra, the mysterious Masked One - all of them bound by their desire for all creatures to bow before them. Under the dark wings of night Torak confronts vengeful ice bears, mistrust, broken promises and a terrifying evil. Another step is taken on his quest to destroy the Soul Eaters, but with it comes the burden of an utterly chilling secret of his own... Dazzling entertainment, seamless storytelling - the third adventure in Torak's quest to vanquish the terrifying Soul-Eaters." Soul Eater is perhaps when my adoration of Michelle Paver really took off. I'd adored Spirit Walker and simply could not wait for the next book. And then something special happened. I won a competition on The Clan (the official website, for those that don't know. It's brilliant and I'm a moderator there now!) to actually go to London for the official book launch in Waterstone's on Oxford Street, to actually meet Michelle Paver! I could not of been more excited. And boy what a day. Michelle was amazing. She actually spoke to us all individually before the signing and actually signed copies of Wolf Brother and Spirit Walker for us while we were actually waiting for the event to start. She was so nice and friendly that I loved her even more. I'd met a few authors before her and none had really made an impression. It felt like they had to be there and didn't really want to be, but Michelle was just amazing. In subsequent meetings with her, I've been surprised that she remembers details you think she'd forget about conversations you've had, in person and by letter (I am a constant pest to her mail bag! :D). But anyway, Soul Eater! This book is when, for me, it got really dark. There were dark moments in the previous two books, but this one was something on a completely different level. It was dark and evil, chilling, more or less from the word go. Soul Eater sees Torak go to the Far North in the dead of winter. Wolf has been taken, and Torak must embark on a journey to rescue his friend, but on his way, he comes closer to the dreaded Soul-Eaters than ever before. 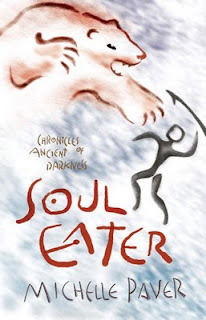 In this book, we get our first glimpse of the Soul-Eaters and they are a terrifying bunch, in particular, the horrifying Eostra, the Eagle-owl Mage. And the cover art really stepped up a gear with this book. The previous covers were fantastic, but this cover is something of phenomenal proportions and is simply stunning! John Fordham does a fantastic job. As does the illustrator Geoff Taylor who crafts the beautiful images at the start of every chapter, and the maps at the front and back of the books! As this series goes on, the research just becomes all the more evident. And with this book, it is plain to see that Michelle has first hand experience of the terrain and conditions in which the book is set. The descriptions of the setting in this book are, for want of a better word, breath-taking. Michelle paints the scene beautifully and this book makes for an excellent read, and leaves you begging for more!